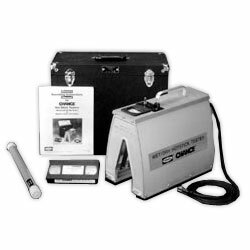 Simple to operate, this portable unit makes easy work of testing insulated live-line tools. It features wet and dry modes selected by a toggle switch and follows procedures specified by ASTM, IEEE and OSHA. Its graduated meter gives precise readout of each tool’s leakage current. For testing any length fiberglass-reinforced plastic (FRP) hot stick up to 3 inches in diameter, the Wet/Dry Tester offers convenience for spot checks at field jobsites or periodic diagnostics in the workshop. It’s like having full-scale test setups for both Wet 75kV-perfoot and Dry 100kV-per-foot in a compact, self-contained unit easily carried and operated by just one person. In the Setup procedure before each use, a zeroing knob is used to set the meter to zero without a tool in the tester. Then the furnished Check Bar is used as a self-check to make sure the tester is functional. A seven-minute videotape included with each unit demonstrates “how-to” basics for Setup, Dry and Wet tests. The illustrated Owners Manual gives specifics which must be read and understood before operating the tester. When the tester is placed on a tool, the meter displays any increase in leakage current due to the hot stick’s presence. This gives an immediate indication of the stick’s true leakage condition, independent of stray currents (through the air, internal to testers, etc.) zeroed out in advance. The tester detects leakage currents due to surface contamination, internal moisture and such internal conductive materials as carbon tracks.